Yo Ho, Yo Ho, May 21 Release for Me! Update: 5/21/11 Added Scott Tolleson pics that Evilos discovered on Scott’s facebook page. Now we can see how they came out! 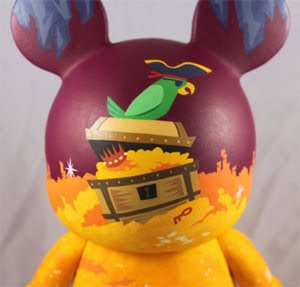 Update: 5/14/11 We now know the details of the May 21st custom Pirates release. 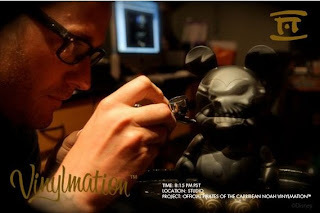 What: Local California artist have been asked to create Pirates of the Caribbean inspired custom Vinylmation. This doesn’t seem to mean characters from the attraction or movie, just inspired by. Javier is scheduled to appear to meet collectors and sign autographs. 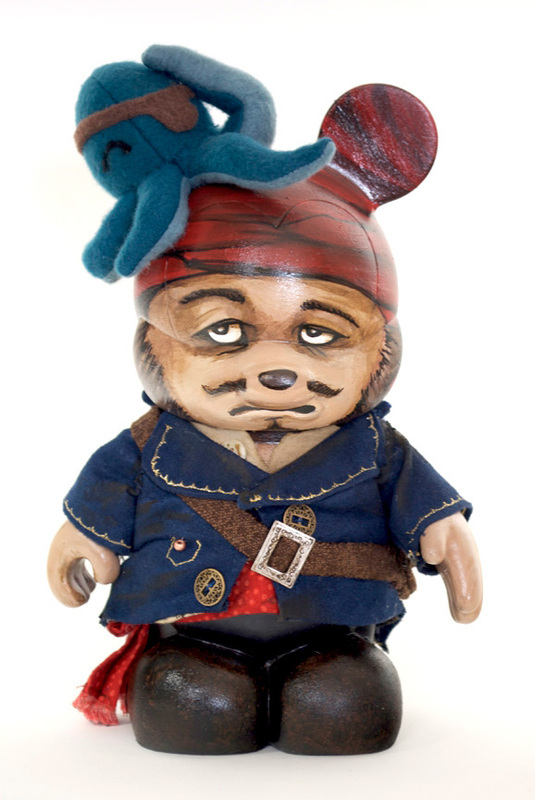 This mixed media figure has a wonderful pirate hat and one bare foot (good thing it’s not dirty). He is also holding a jug of what we can assume is fine rum fit for a pirate! Lana is not scheduled to appear. Another mixed media piece, this one is wearing a nicely designed jacket. He has great detail in his face. And to top it all off, an awesome looking octopus on his head! With an eye patch! Miss Mindy is scheduled to appear to meet collectors and sign autographs. I’ll be honest, I’m not sure if you would find this Pirate at the traveling carnival or on a pirate ship. She has a wonderful peg leg, a great looking custom nose and a very colorful costume. The heart shaped eye patch is attached, not painted. As with the bow on the head. And the skull and crossbones in the ear is a great detail. No word if Scott is scheduled to appear. 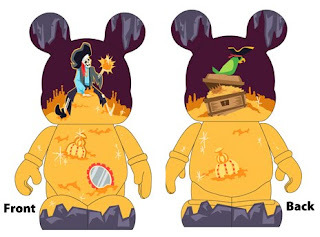 This design is a Pirate sitting on top of his pile of gold. Lots of treasure is seen scattered around the pile. From the background, he appears to be in a cave. On the back is a parrot sitting on a treasure chest. Noah is not scheduled to appear. Noah posted this picture on his own blog the other day, announcing he was creating a limited edition Pirates of the Caribbean inspired Vinylmation. Now its official this will be part of the May 21 release! Julie is not scheduled to appear. Limit TWO (2) items signed per Guest. We ask that you bring no personal items to be signed. Event and information are subject to cancellation or change without notice including but not limited to dates, times, artwork, release dates, and retail prices. Merchandise for signing must be purchased on the event day at the event location. Valid Disneyland® Resort receipt may be required. Paid admission is required to enter Disney theme parks. 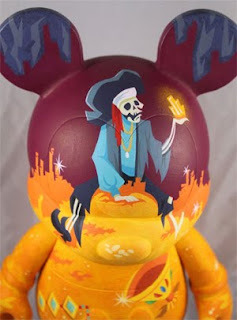 Update: 5/14/11 At Midnight @noahfineart announced that he was ALSO making a Pirate 9″ Custom (as well as the previously announced Little Mermaid custom). So now it looks like the May 21st release and signing is with Noah at Disneyland. Update: 5/11/11 We created a new posted dedicated to all the clues that Noah hints at so this post doesn’t get to crowded with something that is just a rumor at the moment. Remember that the Noah TRON series had 36 individual custom 9″ figures. Each vinyl cost $595.00. Will that part stay the same too? Since the announcement at the Art of Disney blog is only for California, will this series be smaller than 36? The release date is fast approaching. I have a feeling we will find out more, really really soon. 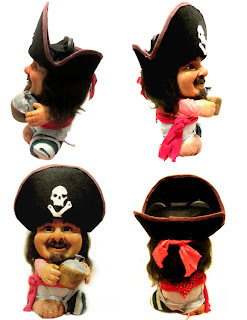 For information about the 12 piece blind box 3″ Pirates of the Caribbean Attraction set scheduled to be released at the “beginning of July” check out our post Pirates Explained. This begs the questions, “Is it just one design? 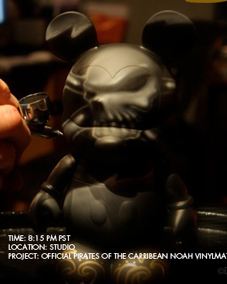 Is it a very limited Series like the Noah 9″ TRON figures? Is it a set of 9″?” What do you think? 4/2/11 It’s April 2nd, so this is not a April Fool’s prank. As normal, we were clicking the links looking for Muppets 2 info on the Art of Disney Event’s page, and lo and behold, they updated it. Most of the dates in the calender are already known, but one new date stuck out. May 21st! The rumored Pirates (of the Caribbean?) 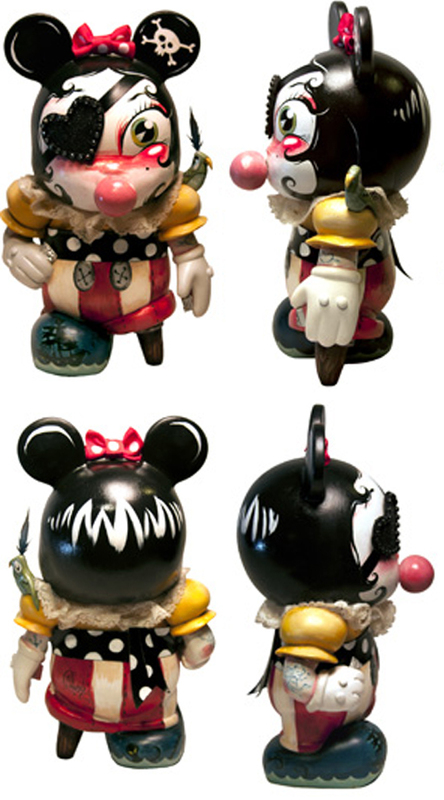 set will be released that day, along with a signing of the set at the Disneyland Resort from 2-5pm. This date makes sense, as Pirates 4 On Stranger Tides opens on May 20th. No word yet on the artist, but since it’s California it’s a possibility that the artist is Monty. Who would you like to see in this set? Characters from the ride or the movie? Jack? Keira? Let us know in the comments! Did they remove the date from the Art of Disney website? I can’t find it anymore – wondering what happened to this event. was in the complete wrong spot – thanks! I gotta say that I hope this is not a super limited, extremely expensive release. As popular as POTC is & as many collectors will want this I’d much rather see a large edition made avaialble so that all collectors could have a fair chance at owning one. agreed, do want to miss out on a cool looking, but expensive piece of art. ; ) I really can’t wait to see what comes out this day, its so exciting. 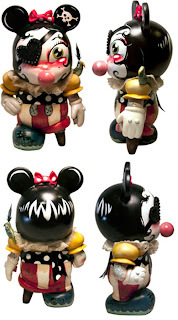 These are such great customs! Amazing how Jeff sculpted his out. 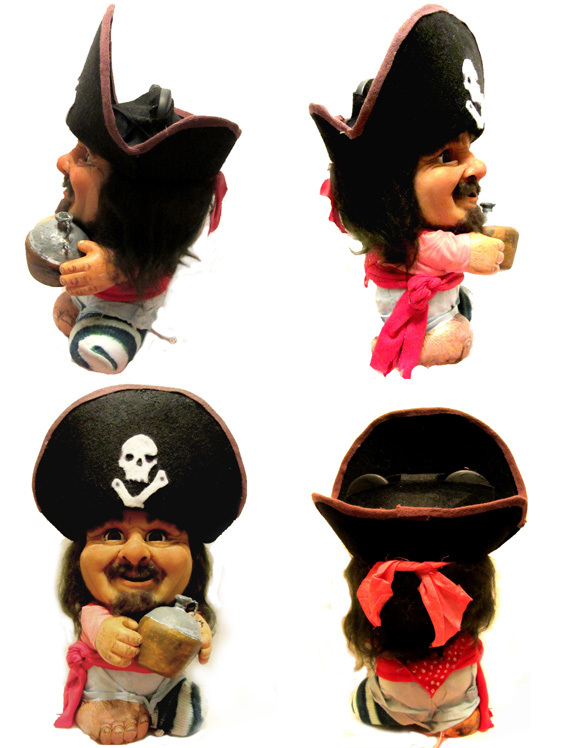 I hope they do a run of the Miss Mindy Bubble gum Pirate, that would rule.